Here at Northern Brewer, we love dogs just about as much as we love brewing (maybe more). For many years, dogs accompanied their owners to work at Northern Brewer and freely roamed our offices. 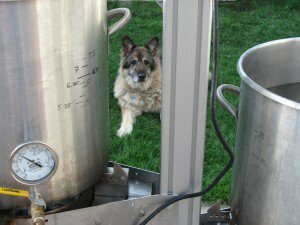 And for many of us, brew day is a wonderful opportunity to spend time with our canine friends. So when we heard about a customer's scary experience after their dog consumed hops we were shaken and wanted to help. For wider education on the issue, we would like to echo a very serious warning about dogs and hops. Though research is not extensive, ingesting hops can be highly toxic to some breeds of dogs (Golden Retrievers and especially Greyhounds have been documented). There are many scary stories on homebrewing forums about dogs eating hops after unsuspecting brewers left unused hops out in a place accessible to their dog, or dumped their kettle trub and hop sediment into the yard, or had a hop plant in their yard that dropped cones on the ground. Some dogs that ingest hops rapidly develop a condition called Malignant Hyperthermia, in which the body temperature rises uncontrollably. This can be very harmful or fatal to the dog. Some symptoms are restlessness, panting, vomiting, abdominal pain, seizures, rapid heart rate, and high temperature. If a dog has possibly ingested hops and exhibits symptoms, they should be taken to an emergency pet hospital immediately for treatment. This abstract from the National Institute for Biotechnology Information represents one of the few scientific confirmations of the issue.